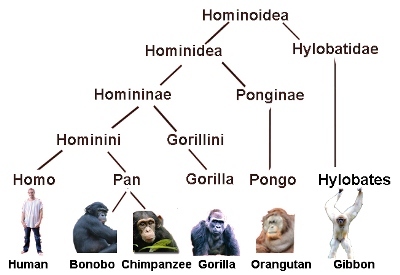 In order to understand human evolution, it is necessary to study the origins of Homo and the branches of Hominoidea for a better picture of our origins. Sir Alister Hardy and Elaine Morgan were proponents of the view that something must have happened in the Hominini clade to create the genus Homo after the split with Pan (bonobo, chimpanzee) with the Last Common Ancestor (LCA) approximately 6 million years ago and they believed it was from that point on that our ancestors entered the water and the changes started to appear. But there is plenty of evidence to suggest that direct homo ancestors were not the only species to adapt to a semi-aquatic environment. All apes were aquarboreal (living in mosaic forest-swamps), probably from at least 20 million years ago (eg. Morotopith) but they were surface feeders (papyrus, mangrove oysters, eggs in reeds, etc. ), not divers, as far as we know. Ardipithecus ramidus, Homo naledi and Australopithecus are often claimed to be Homo ancestors although there is as yet no conclusive evidence that they were. Is it possible that paleoanthropologists have been misconstruing the fossil evidence in their desire to class almost every hominid fossil find a human ancestor? What if, as Marc Verhaegen proposes, some of these fossils belong to the genus Pan instead? It's true that ardipithecus, naledi and australopithecus fossils indicate a largely bipedal locomotion, but it could be arrogant of us to assume that any bipedal ape must have been a human ancestor. Convergent evolution has shown us again and again that a species can develop in similar ways but along totally independent lines due to environmental selection. If the ancestors of Pan also spent time foraging in shallow water for food, they would probably also have developed a bipedal gait and started to lose their fur, (eg: Lucy - Australopithecus - had long fingers for branch-hanging, a small brain, a large airsac = no diving, predominantly ate sedges, in other words, she was a typical aquarboreal. At that time (c 3 Ma) our ancestors probably didn't live in Africa (baboon marker), which would indicate that Lucy is totally irrelevant to AAT). If those species then did a u-turn and returned to a more terrestrial environment, they could have reverted to a knuckle walking, fur-covered ape which still survives today, as their descendents: chimpanzees and bonobos, the latter which still have a strong affinity for water. There's no evidence of littoral diving before 1.8 million years ago (Pleistocene), and then only in Homo, not in other hominoids. Ardipithecus, Apiths, etc. lack any indication of diving, vs Homo: pachyostosis, colonisation of islands, ear exostoses, flat femora, flat skulls, skull keeling, fossils always amid shells. And one species, more than any other, stands out as being far more adapted to an aquatic lifestyle than any other, before or since. They were also the longest surviving species (from 1.9 million years ago to just about 70,000 years ago) and the widest ranging, with the exception of Homo sapiens. It was our diving ancestor: Homo erectus, a species so well adapted to a diving lifestyle, possessing such heavy bones, that he would have had difficulty running over the plains as current theory would have us believe.